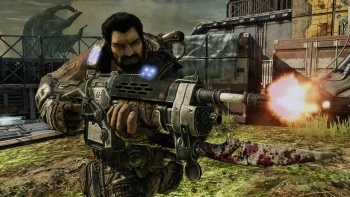 July's leak means that people saw Gears of War 3 at something other than its best, says the game's executive producer. Epic's Rod Fergusson says that he was saddened and frustrated by the news that a leaked build of Gears of War 3 had found its way onto torrent sites early last month, and that he can't understand what would make someone spoil an experience for themselves. Fergusson said that the leaked version was a very early build, and so wasn't representative of the game's final quality. However, he said that it was sad that some people's first experience with the game was not as Epic intended, and not at the game's best. He said that he understood that die-hard fans were hungry for information, but compared the situation to watching a "making of" documentary for a movie you hadn't seen, or being shown how a magic trick worked before seeing the trick. Fortunately for Epic, the game being exclusive to the Xbox 360 meant that the leak was much smaller than it could have been, as only appropriately modified consoles could play the build. Obviously, videos of the content could make their way online, but Fergusson said that Epic was very diligent about tracking them down and having them removed. He also said that anyone who watched videos of the leak had no right to complain about having things spoiled. "I get people going, 'oh no, I just watched this thing on YouTube and it's totally given away something'. And I go, 'well, why did you go looking and why did you watch it?'"